There’s nothing better than sisters!! Especially when they’re this cute! We have a busy week ahead of us. We are working very hard on the float for the Gilford Old Home Day Parade, my cousin Otto is coming Wednesday and of course it’s Clara’s birthday on Thursday. We’ll keep posting the fun were having. Hope you’re all having fun too! Beautiful picture!! Love you guys ! You are beautiful children!! Glad to see the happy smiles. what a beautiful family!!!!! i pray for you & your son everyday. Beautiful picture love you guys so much!!!!!!!!! John you look so handsome. 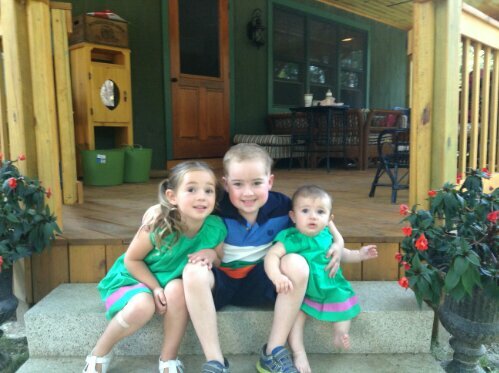 Alison and Jesse you have beautiful, amazing children. Keep on having fun…. The big brother takes care of his ladies! Lookin good and can’t wait to see the parade on Saturday! I love this photo! We look forward to you float at Old Home Day and seeing you! There could not be more love and joy coming through a photo; what a beautiful moment! Thinking of your guys often and get updates from Kristin and Craig. You got this John…one day at a time.